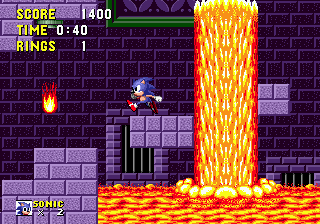 Marble Zone is the second zone in Sonic the Hedgehog, after Green Hill Zone. The zone combines the themes of ancient ruins, caves and lava. In contrast with the previous zone, Marble Zone involves more careful, slower-paced gameplay, such as requiring the player to negotiate moving platforms suspended by chains. The concept of switch-controlled doors is also introduced. Buzz Bomber - Found above ground. Batbrain - Found underground, suspended from ceilings. They will swoop down at you as you approach them. Suspended platform with spikes underneath. Found in underground areas, comes in various sizes. Fireball - Jumps out of exposed lava pools and holes in walls. Wall of slowly-advancing lava. Always moves to the right. In this zone is a particular graphic representing a pair of lions around a fountain, a stereotypical Greco-Roman idea. It somewhat resembles Mario from the Mario series of games, though this is likely a coincidence.